The bowl styles that are pictured below can be woven for you in the size and colors of your choice. Tina always has some bowls available for immediate sale. Please contact Tina directly to make a purchase or commission her to make you a custom bowl. H 7" W 14" D 10"
The design of this bowl is inspired by a traditional basket style called "butterfly" bowl. The two side walls are elevated and curve inward toward the top. Framed in bittersweet vine and woven from red-colored reeds with alternating yellow and orange spokes. What a great holder for the remotes in your family room! 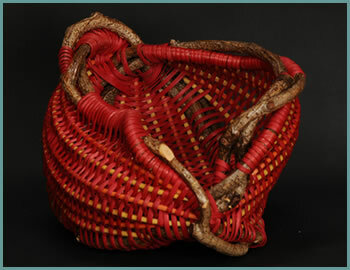 And a collectible piece of basket art at the same time. 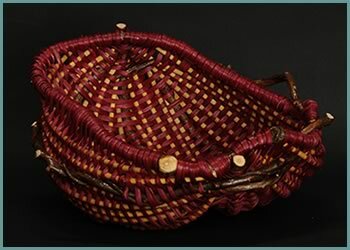 H 5" W 11" D 9"
Place this elegant woven bowl in your entrance way or leave it on your kitchen counter full of candies for you, the family and your guests. Framed out of bittersweet vines and woven with wine colored reeds and yellow spokes.